The Mermaid's Tale: Start taking daily aspirin? Buy stock in Bayer? Last week we blogged about the possibility that many chronic diseases have an infectious origin. Cancers, heart disease, diabetes, asthma and so on rather than having a genetic cause, as the unlimited funding stream supporting the hunt for genes 'for' these diseases suggests, might be infectious instead. It wouldn't be the first time that an unexpected infectious origin was found for a common disease -- stomach ulcers were thought to be due to stress for decades, and the suggestion that they might instead have a bacterial etiology was laughed out of court. Until it was conclusively demonstrated to be the case. Several studies now have suggested that aspirin taken daily in low doses might protect against some of the most common cancers, or prevent its recurrence, including a study just published in JNCI, the Journal of the National Cancer Institute, described in The Guardian here. Researchers pooled the results of a variety of clinical trials of aspirin as a preventive for vascular events -- stroke and heart attack, and found a significant reduction in cancer mortality. The relative risk in this sample of 100,000 people for those taking a daily low dose of aspirin for up to 11 years was 16% lower than in those not taking aspirin. This was a smaller effect than that of previous studies -- e.g., a paper in The Lancet in March, one in a series of reports by the same author, reported that cancer mortality among people taking aspirin for at least 3 years was reduced by a quarter. The latest results are still significant, but the benefit isn't nearly as clear-cut as earlier reports. An editorial accompanying the paper in JNCI discusses the possible reasons for the differing results and concludes that the latest estimates are probably conservative. How this will translate into clinical practice is yet to be determined. There is some risk to a daily dose of aspirin, even if it's a low dose, because it is associated with internal bleeding. So, as long as the size of the effect on cancer mortality is still uncertain doctors probably won't be recommending we all go on aspirin indefinitely. If it is true, though, what's the mechanism? 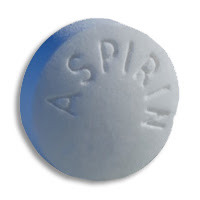 Aspirin is an NSAID, a non-steroidal anti-inflammatory drug, and its two major effects are to reduce inflammation and to inhibit blood clotting. Some have suggested that platelets (blood clotting factors) are associated with cancer, but we explore the inflammation angle here instead because that lead seems more solid. If tumors are infectious in origin, reducing inflammation could conceivably reduce the tumor. A report in the May Current Biology, by Yi Feng et al., does suggest a link between cancer and inflammation, but the inflammation appears to be intrinsic to the tumor itself rather than due to an external infectious cause. An association between the COX2-PGE2 pathway and cancer progression is well-established (COX2 is a gene that regulates one of the prostaglandins, a hormonelike molecule involved in a diverse set of physiological processes such as uterine contraction and regulation of body temperature). COX2 is also associated with inflammation and pain, which is why so many pain relievers, including aspirin, are COX2 inhibitors. It is known that COX-2 is expressed in the initial stages of tumorgenesis by malignant epithelial cells as well as other associated cells including macrophages, a component of the immune system. Previous work by Feng et al. showed that innate immune cells were involved in the earliest stages of tumor proliferation. They now have shown that PGE2 is the signal that is responsible for this. They further show that blocking PGE2 synthesis by inhibiting COX2 expression slows tumor expansion, and suggest that this may be how aspirin, as a COX2 inhibitor, functions to slow tumor growth. We have provided evidence here that a trophic inflammatory response is important for a transformed cell to grow at its inception and that PGE2 produced by innate immune cells via the COX-2 pathway is a key trophic factor for optimal growth of transformed cells at the earliest stages of tumor progression. Moreover, this trophic inflammatory response can be suppressed by the inhibition of PGE2 production via COX-2 inhibitors, which might explain why use of non-steroidal anti-inflammatory drugs (NSAIDs) can reduce cancer incidence. If further work confirms that aspirin inhibits tumor growth, and that the mechanism is as proposed by Feng and colleagues, this precludes the usual idea about cancer and inflammatory response. Rather than infectious agents such as viruses or bacteria, the cells that initiate cancer in the first place are themselves inflammatory. If that is the case, then cancer cells should show some mutations in inflammatory-related genes, that are not found in surrounding normal cells in the same person. That would indicate that the evolution of a particular lineage of the person's cells included such mutation. It allowed the cells to proliferate, eventually to the detriment of the person. A kind of selection would prevent these variants from being in the germ line, because the embryo would develop misbehaving cells, and would die before ever being born. This is not 'natural' selection of the usual Darwinian kind, which is about competition. Instead, in the 'Mermaid's Tale' flavor, it is a failure of cooperation among developing cells within an individual. But the effect is similar: it removes harmful variation. Of course, this is a serendipitous finding if it holds up, because we did not evolve eating aspirin (that is, the same compound, in plants). In the past, cancer got who cancer got. Now, we may be able to counter-act this harmful somatic (body cell) evolution.